The Neo-Pure CTO1-2510 Coconut Shell Carbon Block Filter Cartridge for chlorine reduction is manufactured using coconut shell carbon for improved reduction of chlorine taste and odor. The CTO1-2510 is ideal for use as a reverse osmosis prefilter or postfilter. All materials are FDA compliant so they are an excellent choice for many residential, food service, and commercial drinking water applications. Filter Life Longer Than Competitors. With a filter life of 8,000 gallons @ 1 gpm, the Neo-Pure CTO1-2510 Coconut Shell Carbon Block filter cartridge for chlorine reduction lasts longer than most compatible filters. Reduces Chlorine, Taste and Odor. The Neo-Pure CTO1-2510 Coconut Shell Carbon Block filter cartridge for chlorine reduction is manufactured using coconut shell carbon for improved reduction of chlorine taste and odor. * Customers experiencing issues with chloramine should purchase the CTOX-2510. Superior Sediment and Particulate Reduction. Polypropylene outer netting and layers provide superior sediment and particulate reduction. Ideal for Many Applications The CTO1-2510 is ideal for use as a reverse osmosis prefilter or postfilter. All materials are FDA compliant so they are an excellent choice for many residential, food service, and commercial drinking water applications. High Value at a Competitive Price. The Neo-Pure CTO1-2510 Coconut Shell Carbon Block filter cartridge for chlorine reduction offers an economical and competitive price while providing exceptional performance and high capacity. NSF Certified. 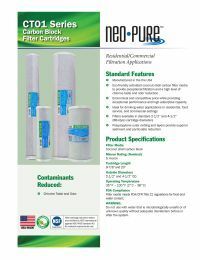 The Neo-Pure CTO1-2510 Coconut Shell Carbon Block filter cartridge for chlorine reduction is NSF 42 Certified for aesthetics. Made in the USA. The Neo-Pure CTO1-2510 Coconut Shell Carbon Block filter cartridge for chlorine reduction is prouldy made and manufactured in the United States of America. Eco-Friendly. Made from earth-friendly coconut shell carbon block, the Neo-Pure CTO1-2510 is perfect for the earth-conscious consumer.